Christmas comes in June for energy geeks and graph junkies. Every year, the Energy Information Administration of the Department of Energy releases its Annual Energy Outlook (AEO), a compendium of 30-tear forecasts and analyses of energy sources and uses. The 212 page .pdf file contains tables, bar charts and area graphs galore, enough to provide blog fodder at least until Christmas (the December one). This week’s installment is a look at production decline curves from selected shale gas plays. The extreme rates of decline experienced in these wells has interesting and far-reaching policy implications, although this angle is rarely described in the mainstream press. For the energy operator, the performance of his wells in aggregate determine the success or failure of his enterprise. 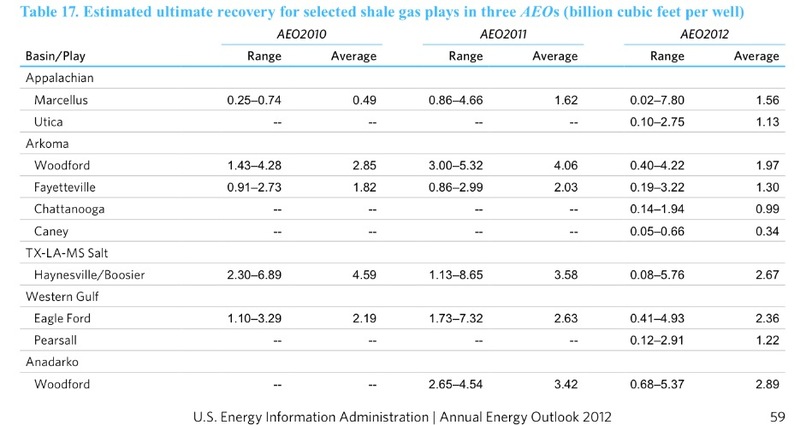 For the nation, shale well performance has become a key factor in energy policy and planning. Reserves and price projections are the key to everything. I promise to keep this understandable at a general business level. Typical production decline curve plots for five domestic shale plays. The curves in Figure 54 at left represent averages for many wells; each well is an individual. But what this curve fails to make explicit is the fact that there are very few wells in these shale gas plays with more than four years of history; the rest is projection. Engineers use decline curves (pdf) as a primary tool for analyzing historical performance of producing wells and forecasting their future performance. The total accumulated past and future production of a well is termed its Estimated (or Economic) Ultimate Recovery (EUR). The EUR of gas wells is measured in billions of cubic feet (BCF). The estimate of future production is termed “remaining reserves”. Since a resource company’s primary asset is its reserves, these squiggly lines have a lot to do with a company’s financial performance. Truth be told, decline curve analysis can be subjective instead of scientific, particularly early on in a well’s life. Tight rocks like shales typically exhibit this characteristic “hyperbolic” shape, declining precipitously in the early years; EUR depends on how quickly the rate “breaks over” to a lower, more sustainable rate. 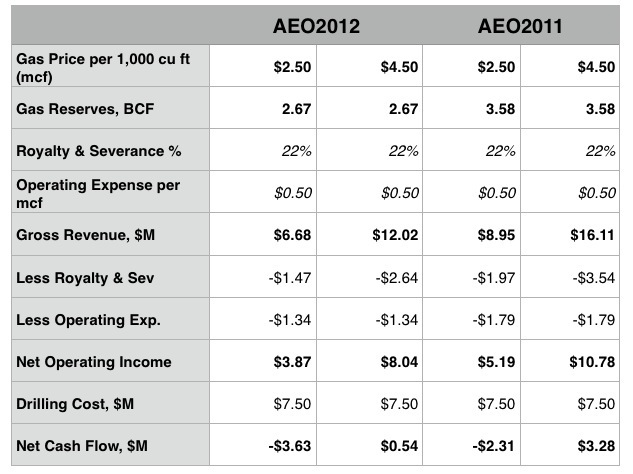 EIA’s Table 17 (click any image to enlarge) shows how reserve estimates have changed in the last three AEOs. In particular, the estimate for average recovery of a well in Louisiana’s Haynesville Shale was 4.59 billion cubic feet (BCF) per well in AEO2010, 3.58 BCF in AEO2011, and only 2.67 BCF per well in this most recent AEO2012. Just as surprising is the inset graph in Figure 54 above, which suggests that a typical Haynesville well produces >95% of its reserves in the first 5 years. The wells produce at phenomenal rates to begin with, but decline rapidly due to the constrained flow properties of ultra-tight shale rocks. U.S. Gas & Oil prices per million BTU, 1997-2012. 1 barrel of oil = ~6 million BTU; 1 mcf of gas = ~1 million BTU. All that “flush gas” coming on the market drove natural gas prices into the basement. As recently as 2004, energy in the form of gas cost more than the equivalent amount of energy as oil (see Figure 34, left). The horizontal drilling and fracking concepts were first proved in the Barnett Shale of Texas; the phenomenal early success in the Haynesville in turn ignited shale plays in across the country, and now those ideas are spreading internationally, too. How big a difference does all this make? For an energy company, it is all about reserves x price; when one or both goes south, it is bad news. When you produce disappointing reserves into declining price, it can be disastrous. Operators have mostly responded rationally to the current oil/gas price situation. The Haynesville produces “dry gas”, i.e. without associated liquid hydrocarbons. A modest amount of oil or condensate produced along with the gas can radically alter drilling economics. Consequently, most operators have refocused their attention away from the Haynesville and other dry gas plays to gas/condensate plays like the Eagle Ford of south Texas or to pure oil plays like the Bakken of North Dakota. 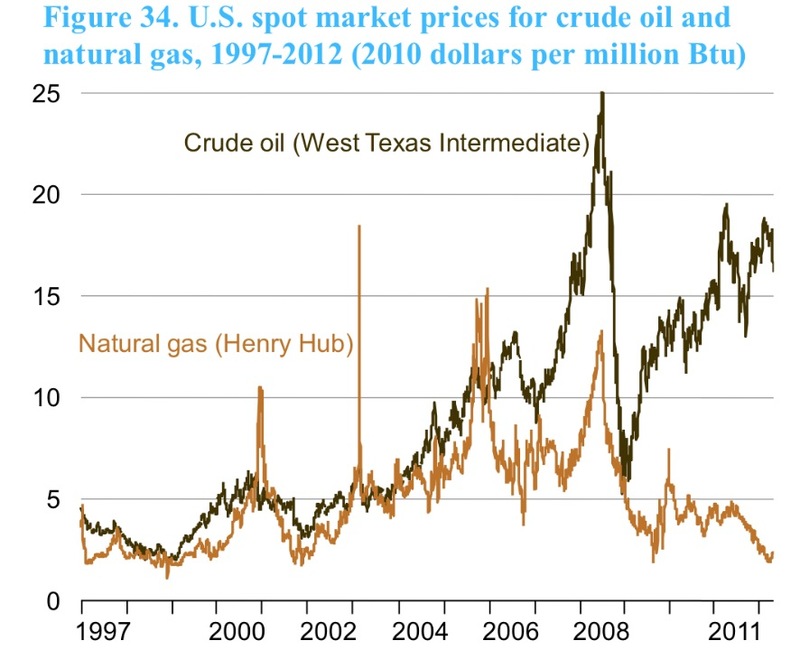 In the Eagle Ford, the gas price matters little because the economics are totally driven by the condensate. Historically, 60-70% 0f domestic rigs targeted gas. Now, only 25% of the rig fleet drills for gas. Long term trends? I look for the historically wide price spread of gas vs oil to close somewhat. Few operators will be able to deliver gas to the market profitably under the current price regime. 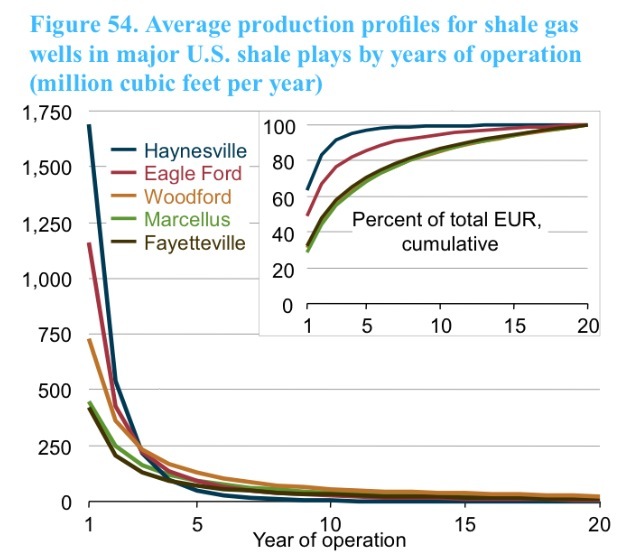 We have already seen the total production curve for the Haynesville peak and begin to decline. Is this the end of the “shale bubble”? Hardly. The shales are everywhere. Each one has different characteristics and a different breakeven price. I suspect that price stability in the $4-$5 range would support an active gas drilling industry. Even at that level, gas would still provide a huge price advantage compared to gasoline as a transportation fuel. Natural gas is clean, abundant and American; it makes up nearly 25% of our nation’s total energy consumption. Of the fuels in our energy mix, gas is the most versatile, useful for electrical generation or for transportation. Domestic drilling is a true, private sector “shovel ready” jobs program that could be kicked into high gear overnight without tax credits and DoE loan guarantees. This entry was posted in Energy, Louisiana and tagged Eagle Ford, Economics. BTU, Haynesville, Natural Gas. Bookmark the permalink.